Our Faculty has a rich and proud history, which began in 1873 with the creation of the School of Practical Science. In 1878, a red brick building, affectionately referred to as the "Little Red Schoolhouse" by generations of our alumni, opened on U of T campus and offered students instruction in mining, engineering, mechanics and manufacturing. The School of Practical Science officially became a part of the University of Toronto in 1906 and was then renamed the Faculty of Applied Science & Engineering. Since the opening of the Little Red Schoolhouse, more than 47,000 students have passed through the halls of our engineering buildings. We have consistently drawn inspiration from the exceptional men and women that have not only made their mark in our Faculty and University communities, but in the field of engineering as well. This is evidenced by the hundreds of awards and honours received by members of our Faculty over the years. Our Faculty has changed over time to include a wider range of engineering programs, new technology, facilities, a broader global perspective and a more diverse community of students, faculty, researchers, industry partners and staff. It is with the same spirit and vigour that current engineering students and Faculty continue to make strides in the field of engineering—improving the lives of others in Canada and around the world through research, entrepreneurship and philanthropy. 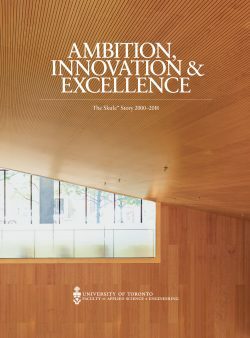 Read more about our Faculty's history in Ambition, Innovation & Excellence: The Skule™ Story 2000-2018. Professor Cristina Amon is the longest serving dean (2006-2019) in our Faculty's last half century, and the first woman dean in our history. Explore a timeline celebrating selected highlights of our Faculty's achievements under her transformational leadership. *Start and end dates indicate term as dean of the Faculty of Applied Science & Engineering. Our Faculty has been a purveyor of "firsts" since its inception in 1873. These achievements are a testament to our Faculty's commitment to an unwavering pursuit of excellence and innovation. Our Faculty celebrates the official opening of our newest building, the Myhal Centre for Engineering Innovation & Entrepreneurship (Myhal Centre), at 55 St. George Street. Julie Payette (ECE MASc 9T0) becomes the first U of T Engineering alumna to be appointed Governor General of Canada and Professor Molly Shoichet is named Ontario’s first Chief Scientist. For the first time in our Faculty’s history, women constitute more than 40 per cent of the first-year class. In the same year, our Faculty also hosts Canada’s largest STEM event for elementary school students, GO NORTH (formerly InnovateU) and Canada’s first conference on engineering leadership education. Aerovelo sets a new record for the fastest human-powered vehicle on earth. In collaboration with the Ontario Institute for Studies in Education, our Faculty launches Canada’s first masters and PhD cross-disciplinary Engineering Education (EngEd) program. In the same year, Michael Helander (EngSci 0T7, MSE PhD 1T2), Zhibin Wang (MSE PhD 1T2) and Professor Zheng-Hong Lu of our Department of Materials Science & Engineering develop the first consumer-ready organic LED lamp. AeroVelo, a Faculty startup, wins the legendary Sikorsky Prize on the international stage, for its successful flight of Atlas, a human-powered helicopter. In the same year, Professor George Eleftheriades and PhD candidate Michael Selvanayagam of The Edward S. Rogers Sr. Department of Electrical & Computer Engineering publishes a paper demonstrating the world’s first “active” electromagnetic invisibility cloak. Additionally, Professor Milica Radisic and graduate student Boyang Zhang and their collaborators at our Institute of Biomaterials & Biomedical Engineering (IBBME) are part of a team that develop the first-ever method for creating living three-dimensional human heart tissue that behaves like mature heart tissue. The University allocates Site 10 to our Faculty for the construction of the Myhal Centre for Engineering Innovation & Entrepreneurship. In the same year, our Faculty introduces Canada’s first Mobile App Lab in The Edward S. Rogers Sr. Department of Electrical & Computer Engineering (ECE). The Engineering Positive Space Committee is formed to celebrate and recognize the diversity of our student body. In the 2015-16 academic year, the Engineering Society introduced the first non-binary student to take on the role of Godiva’s Crown, which has historically been held by a woman student. Microelectronic Circuits, a textbook co-authored by former Chairs of The Edward S. Rogers Sr. Department of Electrical & Computer Engineering, alumnus Adel Sedra and Professor Emeritus K.C. Smith, reaches 1 million in sales. Oxford Press, the textbook’s publisher, has frequently stated that it is its bestselling publication after the Bible and the Oxford English Dictionary. Faculty spinoff, Cast ConneX, introduces customized cast steel structural components to earthquake-proof skyscrapers around the world. In the same year, our Faculty hosts its first Celebrating Engineering Excellence event to recognize and celebrate faculty and staff members. The Agnes Kaneko Citizenship Award, Harpreet Dhariwal Emerging Leader Award, Influential Leader Award, Innovation Award, Quality of Student Experience Award and Research Leader Award, created by Dean Cristina Amon, are presented for the first time at the 2010 event. In 2018, the Research Leader Award is renamed the Safwat Zaky Research Leader Award after Professor Emeritus Safwat Zaky for his contributions as the Chair of the Department of Electrical & Computer Engineering from 1993 to 2003 and Vice-Provost, Planning and Budget from 2003 to 2009. Cristina Amon is named the first woman Dean of the Faculty of Applied Science & Engineering. She has been recognized nationally and internationally for her transformative leadership of our Faculty. Canadarm2 launches on the International Space Station. UTIAS professors Peter Hughes and Gabriele D’Eleuterio, and UTIAS alumnus Dr. Glen Sincarsin extended Hughes’s Canadarm1 analysis to encompass the additional difficulties posed by the Special Purpose Dexterous Manipulator (Dextre), which paved the way for a successful design of Canadarm2. Julie Payette (ECE MASc 9T0) is the first U of T Engineering alumna to travel to space and is a crew member on the first mission to manually dock the shuttle to the International Space Station (ISS). She also becomes the first Canadian to participate in an ISS assembly mission and board the Space Station. For the first time, an alumnus or alumna of the Faculty takes home an Oscar: William C. Shaw (MIE 5T1) wins for Scientific and Technical Achievement, with his three co-inventors of the IMAX projector. Adel Sedra (ECE MASc 6T8, PhD 6T9) becomes the first professor from our Faculty to hold the position of University of Toronto Provost. He held the position until 2002. Jeffrey Skoll (ECE 8T7) graduates and eventually becomes the first employee and first President of eBay, the world’s first and largest online auction site. He goes on to found Participant Media, the successful production company behind such films as Spotlight, The Help, The Best Exotic Marigold Hotel and Bridge of Spies, among many others. Our Institute for Biomedical & Biomaterials Engineering introduces a Master of Health Science (MHSc) in Clinical Engineering. It is unique to our Faculty and is the first engineering program in Canada to partner with a Faculty of Medicine. Canadarm1 launches. The design of Canadarm1 was made possible by Professor Peter Hughes’s development of an innovative approach to the dynamics of robotic arms with elastic links. 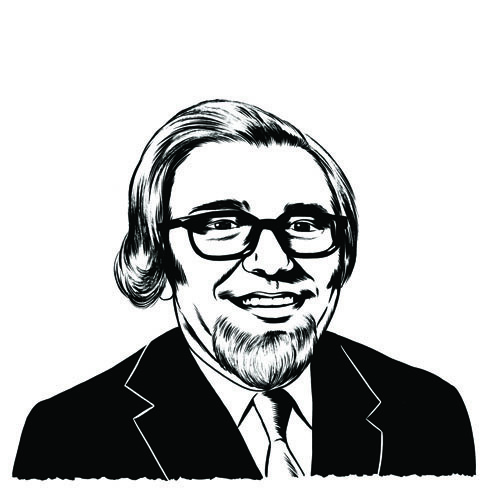 Professor K.C. Smith develops the origins of touch-screen technology in his lab in the Department of Electrical Engineering. It would later become ubiquitous in consumer electronic products. The Professional Experience Year Co-op Program is created within the Department of Mechanical Engineering, with four student placements; the program was extended to all of our departments in the 1980s. By 2018, more than 10,000 students have been placed in internship positions. Professor James Ham becomes the first Dean of our Faculty to be appointed President of the University of Toronto. In the same year, The Cannon is introduced as the official student newspaper of the Faculty of Applied Science & Engineering. Don Allen, Adjunct Professor, Department of Mechanical Engineering, through his company Vibron, designs the stabilizing rings of the CN Tower, then the world’s tallest free-standing structure and the world’s largest tower. Faculty members and undergraduate students in our Department of Mechanical Engineering participated in the Intercollegiate Clean Air Car Race with their electric/propane hybrid vehicle, nicknamed Miss Purity. Remarkably, the team placed first in their class and sixth overall. The Toike Oike is the first newspaper in the world to announce President Lyndon B. Johnson as president of the United States upon his election. A copy of the paper was accepted into the Lyndon Baines Johnson Memorial Library and Museum in 2016. The Institute for Biomedical Electronics opens—the first multidisciplinary research institute to join together the faculties of engineering and medicine in Canada. The Institute for Biomedical Electronics merges with the Centre for Biomaterials and the Tissue Engineering Group in the Department of Chemical Engineering & Applied Chemistry and is renamed the Institute of Biomaterials & Biomedical Engineering (IBBME) in 1999. Chemical engineer Lewis Urry (ChemE 5T0) develops the first commercially viable alkaline battery, the basis of many common household brands. It is considered to be one of the 100 greatest inventions of all time. George Klein (MechE 2T8) invents the world’s first electric wheelchair. To accommodate veterans returning from the Second World War, the University of Toronto’s Faculty of Applied Science & Engineering created the country’s first satellite campus in the town of Ajax, Ontario, in a converted shell-filling plant, approximately 42 kilometres east of the University’s St. George campus. The role of engineering during the Second World War was deemed so vital that the government encouraged students to seek out training in this field, thus explaining the influx of students to engineering programs during this time. The first classes were held in January 1946, and the campus remained active until 1949. The “Rock of Ajax” stands outside the Galbraith building, and two floors of Innis Residence are named Ajax House to commemorate this time in our Faculty’s history. U of T mechanical engineers Paul Dilworth (MechE 3T9) and Winnett Boyd (MechE 3T9) develop Canada’s first all-Canadian jet engine. Skule™ is used to refer to the Faculty of Applied Science & Engineering for the first time, in a Skule™ Nite program. Frank Henry Ralph Pounsett (ElecE 2T8) designs the first car radio for General Motors Canada. Elsie “Queen of the Hurricanes” MacGill graduates as the first woman electrical engineer in Canada. MacGill builds a career as the world’s first woman aircraft designer. In 2016, MacGill was recognized for her achievements and contributions and chosen as a finalist in the Bank of Canada’s search for a “bankNOTEable” Canadian woman to featured on Canadian money. The first “iron ring ceremony” for graduating engineers at U of T is conducted; prolific writer Rudyard Kipling pens the Ritual of the Calling of an Engineer in May 1922 for use during the ceremony, as commissioned by Professor Herbert Edward Terrick (H.E.T) Haultain. 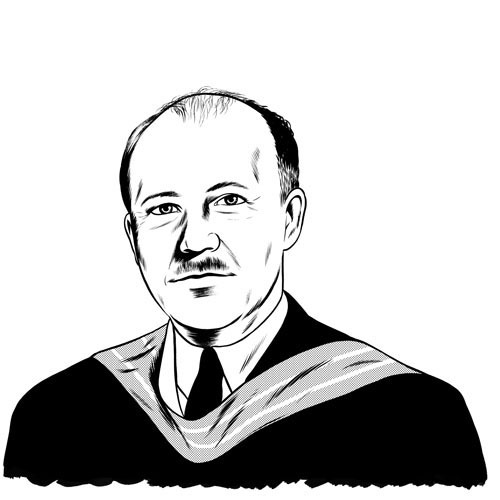 Edward S. Rogers Sr. enrols at our Faculty. Before his undergraduate degree was complete, he created the first all-electric radio station and became the first Canadian amateur radio operator to transmit a signal across the Atlantic. In 2000, our Department of Electrical & Computer Engineering was renamed The Edward S. Rogers Sr. Department of Electrical & Computer Engineering, in honour of the late Edward (Ted) Rogers Sr.
A plot of land at Gull Lake in Ontario is purchased by the University of Toronto for our Faculty. It is the country’s first off-campus teaching facility for the study of surveying, opening its doors in 1920. Known by students and alumni as Survey Camp, it continues to be used by our civil and mineral engineering students and faculty for the practical education of root surveying and topographic mapping. Analytical and applied chemistry student Hildegarde E. Scott becomes the first woman to graduate from the Faculty of Applied Science & Engineering. The Toike Oike is first published as an election paper; it later evolves into a student humour paper still in existence more than 100 years later. Civil engineering student Harry Tate graduates. He goes on to play a leading role in the development of the Toronto Transportation Commission and Canada’s first subway line. The Faculty of Applied Science & Engineering is established within the University of Toronto. John Galbraith is appointed the first Dean. The Engineering Society is formed. John Galbraith, then a faculty member, served as the first President, through four terms. The Ontario School of Practical Science, the precursor to our Faculty, opens its doors as the first engineering school in Ontario.